Inactive pet in your family? Today I discovered that exercise centers for animals really do exist. 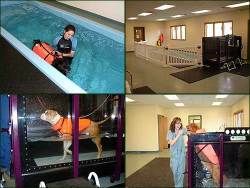 In the US, there is a pet medical spa and rehabilitation facility. North of the border in Canada, there is a pool open just for canines. My curiosity was personal, having taken one of my dogs and cat to the vet for their annual checkups, only to learn that my kitty is 5 pounds overweight (at 18 pounds). I thought; now how can I get my 4 year old indoor cat moving? Hmm...there are gyms for people, I wonder if they exist for the furry demographic? The answer to my own question, as I have inferred, is of course yes. The bad news, for those who are in a predicament like my own, these fitness facilities are for dogs only. Even so, what a concept! The indoor swimming facility in St. John , Canada specializes in private lessons "for the dog that is reactive or has ‘other dog' issues." However, they won't turn you away if you choose to split the cost and share your time slot with a friend. So what does your furry friend get for the cost? They receive access to a heated, indoor swimming pool which is fully equipped with an agility course. And there's also a doggie shower, because naturally your dog needs to be cleansed following his or her rigorous workout. Knowing how much people like to spoil their pets, there must be a market out there for it. No word on whether or not swimming lessons can be added for an additional cost. That really would be capturing a new niche. PetMedSpa & Rehabilitation Center located in Indiana, offers its fitness services as a part of a rehabilitation program for dogs who are overcoming an injury or surgical procedure. However, the technology used only further evolves the fitness industry for animals. They have an in ground swimming pool with jets, a land and underwater treadmill, an Electro Stimulation System, therapy bands and balance boards. So, while I have not directly solved the problem of my overweight cat in my quest, I have found a business concept that remains uncharted territory. Why not combine similar equipment used for puppy rehabilitation with an indoor pool for your furry critters? With this development, there would finally be a full fitness center for dogs. And, better still, how about establishing a facility and creating a program that caters to cats? It should come as no shock to you that this is a common problem for cat owners; I mean, just look at Garfield. Well entrepreneurs, I've brought you your next big business idea. So get out there and setup your own animal fitness center!